Highly sophisticated in both their design and attention to detail, De Dietrich ovens exude elegance, largely down to the fact that they are created from the perfect combination of premium materials in glass, stainless steel, and copper. 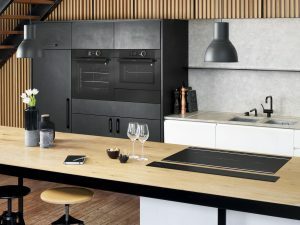 The Chef Inspired ovens not only look smart but have an unrivalled functionality, with exclusive technology that is patented by De Dietrich, a fully automatic cooking experience is made possible in the ‘Chef’ Mode. With this technology, only owned by De Dietrich, the humidity sensors equipped in the oven allows all settings to be adjusted automatically for you while cooking; from the cooking mode to the ideal temperature and even the cooking time. De Dietrich ovens also offer a Culinary Guide with up to 50 pre-set recipes for high quality cooking. From roast beef to crème caramel, you can enjoy delicious dishes with little effort during the long winter evenings. With De Dietrich’s Chef inspired ovens, you can perfect any dish like a true professional – When others notice, don’t be surprised by the inevitable acclaim! De Dietrich ovens come in a variety of colours: Absolute Black, Iron Grey, Platinum and Pure White, made to suit any kitchen or style. By incorporating the same De Dietrich know-how with cooking methods worthy of great chefs, De Dietrich transforms the cooking experience into an art of precision and excellence.